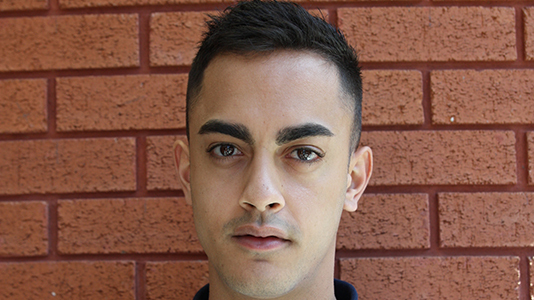 Pablo Segovia decided to study at LSBU after attending one of our Open Days. "I got a really good first impression of the place," he says. "I was impressed by the facilities tour, and of course the location was a big factor too. Having seen the place for myself, I felt it was the right place for me to study, somewhere I could build a great portfolio of work while gaining useful experience. I was very aware that I was not only being given the chance to study in London, I was also being given the chance to work here at the same time." "It was a great environment to learn in," says Pablo. The tutors were all very confident in their knowledge and ability, and they communicated their ideas clearly and simply. That kind of approach rubs off on students very easily – the assured nature of the academic team was transmitted to all of us, and really helped us to find our own voices as filmmakers." Like many students on our BA (Hons) Film Practice course, Pablo was encouraged and supported to enter his work for film festivals, which provide students with excellent experience and can result in superb networking opportunities. It was in one such film festival, the Screentest National Student Film Festival, that Pablo enjoyed one of his greatest successes to date. His film 'Outsiding' was nominated in the Best Film category, and won in the 'Best Experimental Film' category, much to Pablo's delight. "I had submitted to the festival previously, and found that the experience I picked up helped me the second time round – having done a screening before and read through the positive feedback from my first effort, I was able to make 'Outsiding' the best it could possibly be," he says. Festivals give you a great networking opportunity – a chance to make new contacts, and to secure internships and work experience – so entering them helps you to develop as a filmmaker in lots of different ways. That ongoing help and support from the academic team is something that recent graduate Pablo is still benefiting from even now. "I'm currently doing some freelance work for an events company called Chilli Sauce, which Patrick Tarrant, the Course Director helped me to secure," he says. "They film a wide range of corporate events, so I am working for them as a cameraman and editor – it's all valuable experience and I am hoping to get some more work from them." Pablo is currently considering continuing his education with a Masters degree, but whatever his next step is, he is keen to stay in London. "Ultimately, I want to be working full-time in the industry, and where better to do that in London?" he asks. "It's a great place to meet people from a wide variety of backgrounds, a collaborator's dream, and it is rich with fantastic location options. London is definitely the place I see myself in for the foreseeable future and it is a great place to be, whether you are a student or working in the industry full time.